Most features are not enabled by default or only implemented in development versions of the web browser. 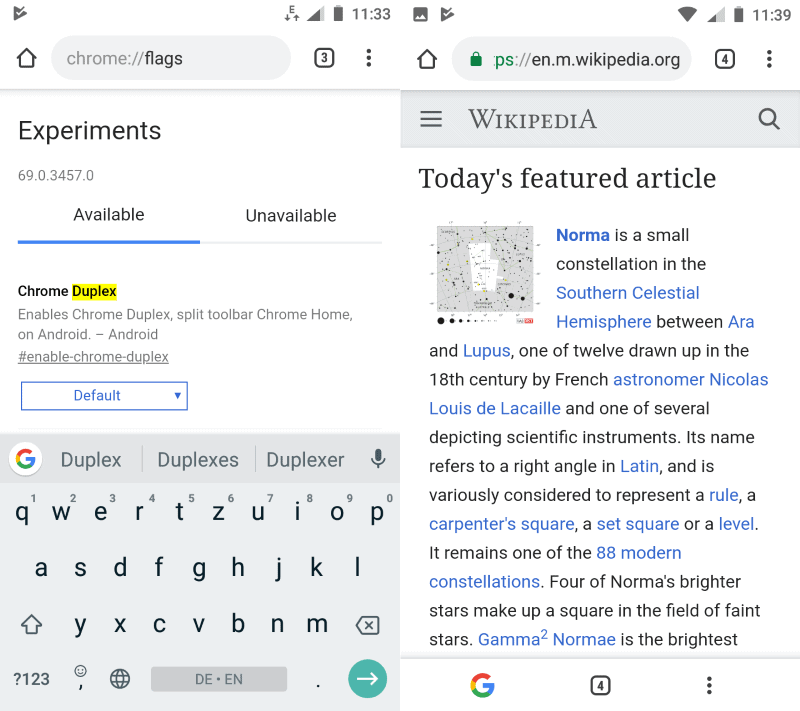 Google's newest experiment is available for users of Chrome Canary for Android. It is called Google Duplex and it seems to take some of Google's ideas for a bottom address bar in Chrome for Android called Chrome Home and mixes it up with other functionality. Basically, what Google Duplex does at the moment is display three icons at the bottom of the browser screen. It is definitely a work in progress as two of the icons are copies as they offer the same functionality as the buttons attached to Chrome's top menu bar. Think of Google Duplex as Chrome Home without the bottom address bar. The most likely plan that Google may have with the implementation is to move these to the bottom eventually as it feels highly redundant. The Google button activates the URL field of the browser so that you can start typing rigght away. The Tab count indicator displays open tabs either vertically or horizontally depending on your preferences. The menu button displays the main menu when you activate it. Android users who want to give this a try need to download Chrome Canary from Google Play and enable the following flag in the browser. Load chrome://flags/#enable-chrome-duplex in Chrome Canary for Android. Switch the status of the flag to enabled. Google Duplex is not that spectacular or exciting right now as it copies two existing functions and the only new function just activates the address field in the browser. Based on that, I'd say that Google Duplex is a work in progress. It seems likely that Google will modify the feature in the coming weeks and months. Whether Google will launch Google Duplex in some form to the stable channel in the future is up for debate. It seems almost certain that a bigger redesign of Chrome's interface will be pushed to stable versions of the web browser eventually but whether that involves a bottom tool bar, bottom address bar, or other major interface changes is up for debate. Now You: Do you prefer the address bar at the bottom or top? Thanks for warning us MR Martin…Android used to function quite well on it’s own before Google hijacked it. I wonder how many tracking scripts are in that canary of a browser. Thanks for warning us Mr Martin…Android used to function quite well until Google hijacked it. I wonder how many googler tracking scripts are in that canary of a browser. Google bought Android in 2005. You were using it more than 13 years ago? Nice! Definitely bottom. They should give us the ability to choose by ourselves what we prefer. In order to switch between the pages or go to the new website I have to use 2 hands, which is really annoying. I still don’t get why Google decided to remove this really useful function. It’s kinda weird, but yeah.. there’s some alternatives like Opera, Yandex or even Samsung Internet.